We have an old Vaillant Turbomax boiler with a VRT 378/2 thermostat. 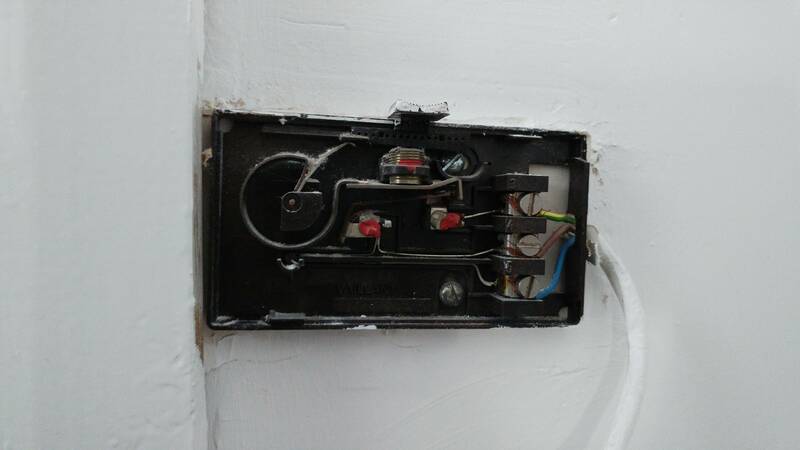 I'd like to replace the thermostat with a Salus RT500 RF, but I'm not sure if it's possible with the current wiring. The new thermostat has four terminals: N, L, COM and NO. The instructions say that you have to link COM and L. And I'm guessing that the old blue neutral wire connects to the N terminal. What about the rest? Which of the two L wires (in or out) connects to L? And what connects to NO (Normally open / live switch)? Also, is it only a matter of figuring out what connects to what, or am I missing something crucial? I understand that it's better to get an electrician out to do it, but if it's possible to do it myself, I want to give it a go. There is a problem, one is allowed to over sleeve most colours in a cable except for green/yellow which must only be used as earth. It would seem some one has broken this rule. Also for fixed cables you must provide an earth even if not required, if not required then it is simply terminated or taped up. You only NEED two wires, line in (com) and line out (NC) for battery powered thermostats, but the older thermostat has a compensation heater which to work needs a neutral, without the neutral connection there is a large gap between temperature at which heating cuts out, and temperature when it cuts back in again. From what you say it would seem some one has used the green/yellow as a line, there may be some excuse for using green/yellow as neutral even if against the rules, but using it as a line is rather dangerous. 1) rewire at both ends, use same wire but make the green/yellow earth and use a thermostat which uses batteries. 2) rip out the cable and use 4 core cable instead. The Salus RT500 RF base unit can be mounted next to boiler as the unit is in two sections, so just disconnect original cable and wire direct to boiler. I missed that on original reply.